Foot pad keeps jack from sinking into soft dirt or sand. 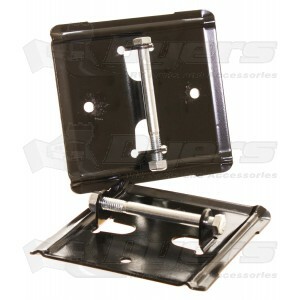 For use with "C" series standard or motorized jack. We got just what we wanted - good quality - service was excellent - glad that we found Dyer's RV Parts and will use them again. Worked as I hoped and makes the stabilizer jacks much more secure. My Lance trailer came with stabilizer jacks with no feet. The small ends of the jacks just sank into the ground. With the plates attached, there is a noticeable difference in movement in the trailer because each stabilizer foot is broader and able to better support the load. just the best , will be returning to buy more. Used the BAL Pads for two weeks of camping and I am most pleased.